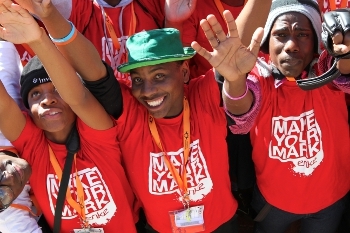 enke: Make Your Mark (“enke”) is a youth development organisation that inspires and supports young South Africans who are taking action on the most urgent social issues. We empower young leaders to make their mark on their community, their country and their world. enke participants develop as socially conscious global citizens and initiate their own community-based development projects, creating change on the issues they care about most. Bongani Gqweta and Bongani Pontsana are two Grade 12 students from Khayelitsha, Cape Town, who were concerned about the poor science pass rate amongst their peers and the general lack of enthusiasm for science subjects amongst the majority of students at their school. They weren’t sure how to go about tackling this issue, until they participated in the 2012 enke: Trailblazer Program and going through training at the enke Forum in Cape Town, Bongani and Bongani returned to Khayelitsha empowered and inspired to share their passion and high esteem for science subjects. They formed a team and established the first ever science club at their high school (Masiyile Senior Secondary School), as well as providing peer- to-peer tutoring in science subjects to their classmates through an after-school study club. Our 2012/2013 cohort graduated in May this year with 176 participants of Grade 10’s and 11’s, who engaged in the high school targeted enke: Trailblazer Program, having a secondary impact on over 6,490 individuals across South Africa, through their community action projects. Projects ranged from programs of teaching and mentorship to improve their peers’ grades, awareness programs on teen suicide and teen pregnancy, peer motivational workshops to address social apathy, food and clothing drives, as well as after-school entertainment clubs to provide a safe haven for youth in their communities. 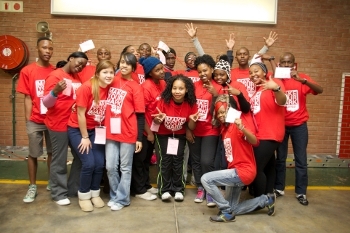 The diversity and breadth of enke participant projects show that young people not only care about their communities but that they are capable of driving positive change within their communities once equipped with the skills and support. We look forward to witnessing the positive impact our 2013/2014 cohort, who enrolled for the enke: Trailblazer Program in June and July of this year, will have on South African communities going forward.